High quality Chemistry teaching at the University of Southampton has been recognised in a sixth Senior Fellowship from the Higher Education Authority. 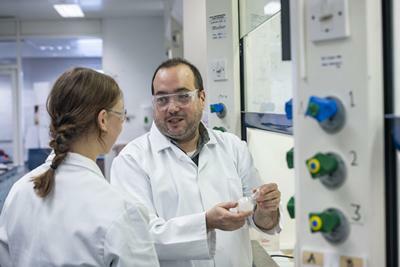 Associate Professor Dr Ramon Rios, a member of the Synthesis, Catalysis and Flow research group, has become the latest member of the School of Chemistry to be certified by the national standard. The Senior Fellowships, which are administered by Advance HE, demonstrate a commitment to teaching, learning and student experience, through engagement in a practical process that encourages research, reflection and development. The University of Southampton contains around 60 Senior Fellows across its full range of subjects, including Professor David Read, Professor Simon Coles, Dr Paul Duckmanton, Dr Thomas Logothetis and Dr Sam Thompson from the School of Chemistry. Chemistry’s Senior Fellowships have all been awarded in the past four years, with staff members benefiting from a new mentoring programme which is helping share best practice. Ramon Rios joined the University of Southampton as a Reader in 2012. He has been a Visiting Professor at the Nagoya Institute of Technology in Japan and Sungkyunkwan University in South Korea. He has published two books on the Pauson-Khand reaction and Organocatalysis, authored more than 125 papers, written 15 chapters in chemical books, filed one patent and had more than 6,000 citations in his career to date.